Teauna Upshaw, MBA, PHR is the Founder & Managing HR Consultant of Workforce Initiatives. Her role has significantly impacted small business owners with human resources/people strategies and individuals grasping their keys to career and professional success. 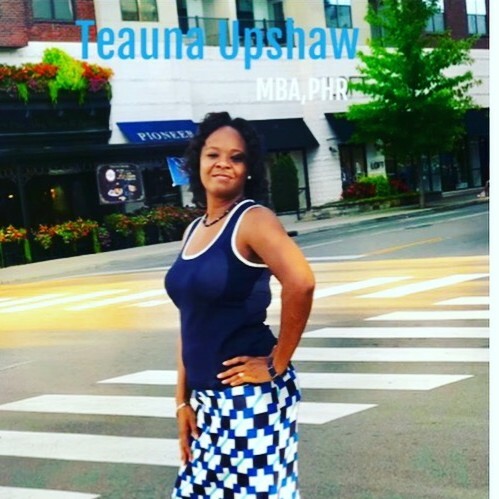 As a published author of “Teauna Upshaw’s Working Success” she directs her mission to empower, transform and create the initiative in people to understand the concepts of "Working Success". She has been a strong vessel directly impacting HR functions and management teams with demonstrated success in reducing turnover and enhancing working relationships amongst employees and leadership. Teauna has successfully placed qualified talent in organizations, reducing the need for contingent staffing and consistently nurtures the quality of each hire. Presently she is an HR Manager supporting a manufacturing organization of 300+ employees. Teauna's previous work experience includes performing in roles as an HR Generalist, Staffing Agent, Benefits Service Representative, Personnel Assistant and other HR supporting roles. She enjoys facilitating training, on-boarding and contributing to retention programs. Her professional support and solutions create positive results for individuals and small to midsize businesses in acquiring and managing human capital through the effective use of professional development training, behavioral workshops, career coaching, and outplacement services. Teauna is originally from New York and currently resides in Murfreesboro, TN with her spouse, Retired Master Chief John Upshaw of the U.S. Navy and her active two children, Taylah and Tahmar. Additionally, she naturally empowers and inspires an audience as a professional speaker for seminars, conferences, and workshop events. To learn more about "Teauna Upshaw's Working Success" visit Teauna on her "Workforce Initiatives" Facebook Page. Find out more about Teauna Upshaw's Working Success at http://www.workingsuccess.org.